Our firm has gained continuous appreciation as the prime organization offering Evaporator Unit. The offered unit is equipped with agitator, coil, control box, stainless steel frame and OEM approved components. Offered unit is developed using stainless steel materials and certified electrical components. Also, our professionals assure that the unit is manufactured adhering to international industry quality standards for delivering optimum performance. Furthermore, clients can get the unit from us at industry leading rates. We are counted amongst the recognized organizations offering premium quality Evaporator System. This unit needs power in-between 240V to 280V. The capacity of the offered unit is 0.8KW to 160KW. Additionally, the unit uses copper pipes with aluminium fins for transferring vapour. Also, our engineers require 2m2 to 360m2 of area for installing the unit. Apart from this, our professionals have manufactured the unit adhering to industry quality standards to assure finest performance and safety. 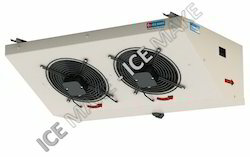 We are a leading manufacturer and exporting of Evaporator Unit. Coil - High Efficiency heat exchange with in-line tube system for minimum loss of air flow between fans and large surface area for better cooling. Defrost - Use electrical heating stainless steel pipe, high leakproofness at the end, anti-electrical leakage and long life. Maintenance - Compact, adjustable & easily openable side panels for easy installation.